I can't believe how talented the ladies over at Craft Project Central are! 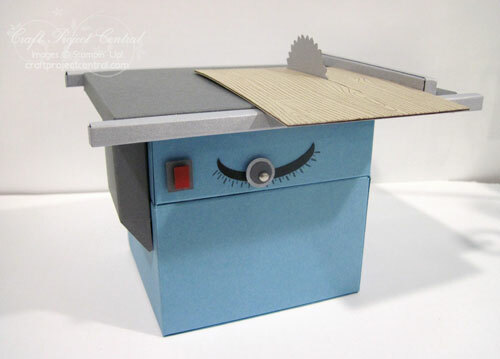 Isn't this table saw card holder great?! The very creative designer that came up with this great project is Amanda Corbet. Do you know someone who likes to work with wood? Do you want to give them a gift card in a really special way? Then this project would be perfect! This interactive Table Saw Gift Card Holder will require the recipient to do just a little bit of work to get the gift card out, and in the process it looks like the table saw is cutting a piece of plywood! If you would like to learn how to make this great project, you'll want to subscribe for the month of May. With your subscription, you'll get illustrated, step-by-step instructions for 10 wonderful projects for only $10! You can find out how to gain access to a bonus project over at Craft Project Central. Please leave a comment for Amanda to let her know how great her project is, too!